This elongating silhouette comes in a comfy, spongy fabric that retains its structure throughout the day. Just add a blazer for the office, plus a killer red lip come happy hour. Oh, did we mention it’s machine washable too? Made in NYC. Slim, long fit that skims your body. Our model in black is 5’9.5” and wearing a size 2. Our model in cobalt and pine is 5’10.5” and wearing a size 4. 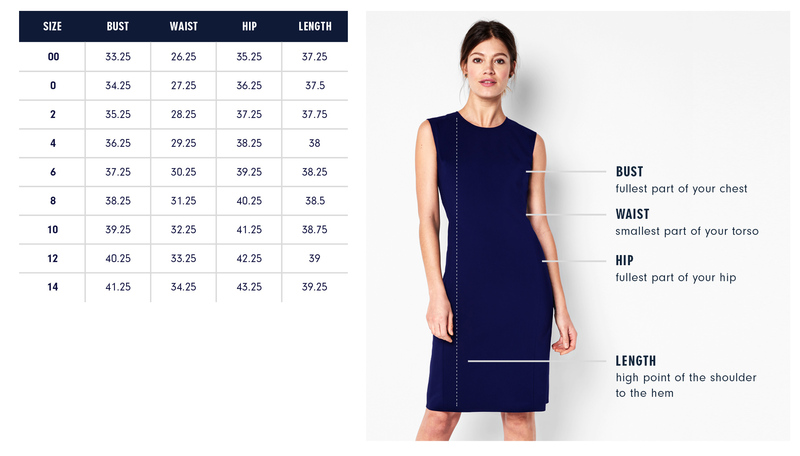 Below are the exact measurements of the Bedford dress. All measurements are in inches. For general brand fit, sizing, and measurements, please visit our Brand Fit & Size Guide. Slim, long fit that skims your body. Hemline falls just above the knee. I set out to create a modern sheath dress featuring clean, geometric lines. I angled the princess seams and eliminated the need for a waist seam so this style would be flattering on a variety of sizes and heights. Features: Vent at center back for added movement. Hidden back zipper.